Hi everyone!! This summer has been so crazy, but I think I'm back to blogging all the time now! Moving kids in, moving kids out, graduations, packing, unpacking, family reunions etc has made this the busiest summer that I can remember. For the last 10 days, we've been in Florida. We brought our daughter Kelsie down to her internship in Disney World. We drove 2 cars down, so she can have a car for the 5 months that she's there. We just drove back to Rhode Island late Saturday night…long haul going down and the worst traffic coming back. I've never seen so many cars in all my life and we've driven to Disney world several times since the girls were little. I have have a few pictures to share from our trip, but I have to organize those before I do. Today, I have some pictures of a closet re-do that I did earlier in the summer, so I though I'd share them with you. A couple tips and tricks to organize a small hallway closet that I keep changing around. 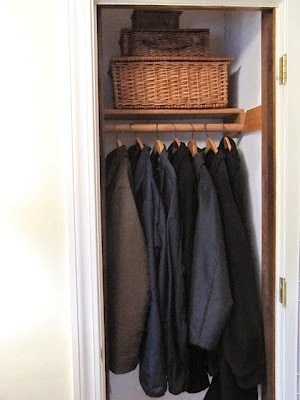 Here's the original coat closet…I now have coat hooks on the wall of the back hallway for our coats. My family hangs things more on hooks than they do on coat hangers. I have also have a closet in that back hall for guest coats too, if needed. For the last few years, our house has been full of people, moving in and moving out. We always needed lots of food around, so I converted the coat closet to an extra food storage pantry. It worked great for a long time. Now, Courtney and Courtland have moved into their own apartment, Kelsie has graduated from college and is in Florida and her friend Emily who lived with us, has moved back home. I really miss having them here because we love a busy house, but this much food isn't necessary for just my husband and myself. 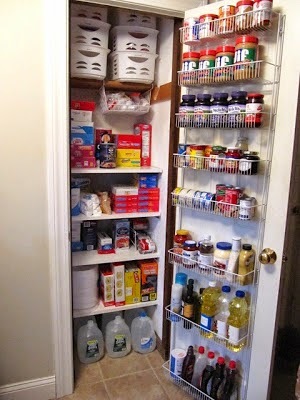 If you'd like to visit this post for all the food storage organizing tips you can CLICK HERE. So here is the re-do (for now, lol)…a broom closet! It's nice to have things all in one place. Before, I had things hanging on the walls going down to our basement. Come in and see the changes and little things that might help you too! The first thing I did was to move the larger rack from the food closet to a different closet. I found this short one in a thrift store, but I've seen them in Home depot or Lowe's and sometimes Walmart. The shelves are great to hold the extra cleaning supplies I buy when they are on sale. That way they don't get buried in the back underneath my kitchen sink. I also add double hooks under the shelf for dusters, dust pans, fly swatters etc. I shared this tip a while back…use zip ties at the ends of handles, so you can hang them on hooks without using the tiny holes that come on the handle. CLICK HERE if you want to see that post. The side walls of the closet are perfect to hang brooms and mops. Always get double hooks, so you can take things off without having to remove all the items to get to the one you want. An old shoe organizer is perfect to hang in the empty space in the center of the closet. Great to hold all your rolls of paper towels. This will give you more shelf space too, when you have them hanging vertically like this. These shoe bags just velcro over the rod in the closet. With the bag hanging in the center, there is still plenty of room in the back, on either side for my vacuums. So here's one more transformation for this tiny little closet. I wonder what will be in store for this space in the future!! Thanks for stopping by and for not forgetting about me this summer!! It's good to have you back again!!!! It must be strange to have an empty house!!!! I so wish I had a space like your closet!!!! I really could do so much with it!!!! Love the tips as always!!!! Have a fab week!!! Oh Karen! I have really missed you and your brilliant ideas. So glad you're back now. This closet reorganization is typically clever - wish I had a closet I could do this to. You have the most brilliant ideas!!! Karen this is amazing! Our last home the coat closet my hubby turned into a sewing closet for me. This one we will pull out the furnace when we get central air and now I have lots of ideas! I really have missed you! Great ideas! I don't have an available closet to turn into a broom closet, but I can sure use your other ideas. Zip ties to make hanging easier. A shoe organizer for towels! Great idea! My two fave ideas are the cable ties (PINNED IT!) and the paper towel storage. Another great post! My son Andrew graduated from college in June (here in PA) and did the Disney college internship at the same time as your Kelsie! He is a theater major and worked in Hollywood Studios at the Rockin' Roller Coaster - had the time of his life! Just like the mop and broom racks they make for mounting on the wall, you can also buy these made just for spice containers!